The Cherbourg plant will have the capability to manufacture the world's longest blade at 88.4 meters. LM Wind Power, a leading, global manufacturer of wind turbine blades announced today that it will open a new wind turbine blade factory dedicated to the offshore market in Cherbourg, Normandy, France. The factory will be built on a site developed by Ports Normands Associés (PNA), a port authority that includes the Normandy region and the Manche Department. Ground breaking will begin in March 2017 and production is expected to commence from June 2018. Ultimately, the company expects to employ over 550 people, with as many as 2,000 further indirect jobs resulting in the local area. LM Wind Power has worked together with the Normandy local authorities and in particular the Normandy Region in order for this new factory, ideally located on the port of Cherbourg, to be able to start production swiftly and serve the growing offshore wind market. This facility will have the capability to produce the longest blade in the world, the LM 88.4 P. The company expects the operation will grow to a capacity between 1.2 and 2.0 Gigawatts (GW). With this potential for significant growth, it would offer even more jobs. The plant will serve all customers in the global offshore wind blades market, but the decision by LM Wind Power to start construction has been greatly facilitated by the concurrent signing of a supply agreement with GE for the blades powering its Haliade offshore wind turbine. The French government has awarded two tenders in 2012 and 2014 for 3 GW of offshore wind production. More recently, Minister of the Environment, Energy and Marine Affairs, Ségolène Royal, announced two further projects, both on the French coast. The larger turbines and blades for offshore wind require a coastal location and manufacturers need access to a modern and efficient harbor which is clearly the case in Cherbourg. This blade factory project for the offshore wind market in Cherbourg benefits from strong support from the Normandy authorities. Ports Normand Associés (PNA) has invested heavily to prepare the port in order to welcome industrial companies such as LM Wind Power to develop renewable marine energy. A project of this scale has to endure multiple, complex iterations with customers, local and regional administrations and government. Through working together, all have contributed to making the project a success and an exciting prospect for the future. This factory will become a base for serving the growing European offshore market. "This move recognizes the strategic growth of offshore wind energy in Europe and the emerging commercial opportunity for Cherbourg and the surrounding region. 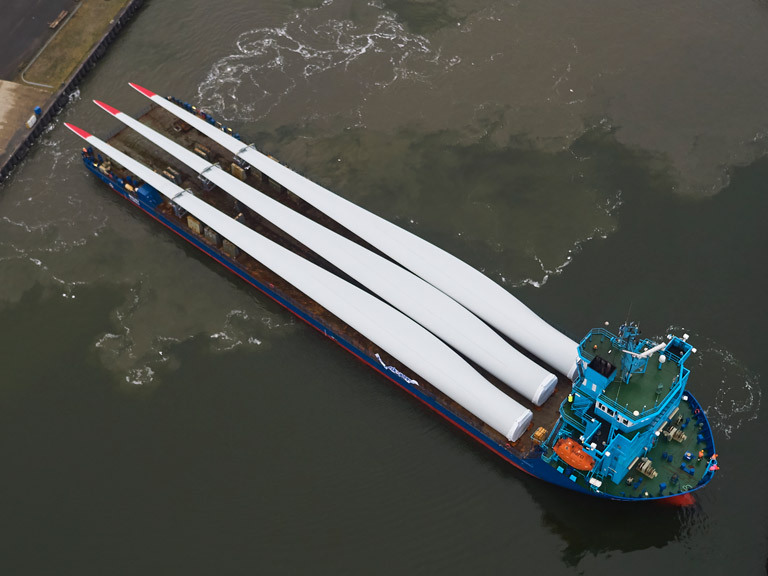 As a leader in wind turbine blade manufacturing, LM Wind Power has a proven track record of success in building long blades to meet the harsh and demanding challenges of marine operations. Blades of this enormous scale represent the leading edge of technology, reducing the Levelized Cost of Energy (LCOE) to make offshore wind competitive with onshore wind, fossil fuels and nuclear energy. The addition of this new facility will bring significant, highly skilled, long-term, sustainable 'green' jobs to the region benefitting the economy and the local community," said Alexis Crama, Vice President Offshore, LM Wind Power. "The Region very strongly supports this expected and essential project for North Cotentin and Normandy. I am delighted with this excellent news. Since January, I have reached out to many people to make this project a reality. Beyond the support for the project, I agreed that the Region should make an additional effort and, take on part of the risks associated with possible delays due to the recourses affecting the French offshore wind farms" said Hervé Morin, President of the Normandy Region and of Ports Normands Associés. "I am delighted with this announcement which is the result of the support of local authorities since the beginning and which consolidates the innovative and future-oriented offshore wind industry, a landmark for the development of the area" said Philippe Bas, President of the conseil départemental de la Manche, former Minister. LM Wind Power is a world leading designer and manufacturer of rotor blades for wind turbines, with a global manufacturing footprint that includes blade factories in Brazil, Canada, China, Denmark, India, Poland, Spain and the United States. The company has produced more than 185,000 blades since 1978, corresponding to more than 77 GW installed capacity and global savings of more than 147 million tons of CO2 annually.